website has news in 29 languages. Radio New Zealand "The Voice of the Pacific" covers Papua-New Guinea, the Solomon Islands, New Caledonia, Fiji, and other places in Oceania as well as New Zealand. Radio Free Europe RFE has news and links to Internet podcasts. Shortwave Schedules in English: hfradio.org has English language shortwave broadcast schedules organized by time and frequency. Also try Prime Time Shortwave (organized by region and country). Radio-Now.co.uk is a directory of UK-based online radio sources. Shortwave.be links to the websites of shortwave broadcasters, including some not listed here. RadioPortal.org is a searchable, categorized database of over 26,000 shortwave links. OntheShortwaves.com includes articles explaining early radio history in general, and the history of shortwave listening and "DXing" (trying to hear the most distant stations) in particular. Zenith TransOceanic Radios "During its life the Zenith TransOceanic Radio was the finest tube-type portable shortwave radio in the world... The fact is that it had everything necessary to be a luxury item - fine craftsmanship, often to military specs... Tremendous performance." An overview of all of the models of these radio collector's items, with photographs, info on tube and battery replacements, links to other radio collectors sites, and more. Phil's Old Radios, also known as antiqueradio.org, is a comprehensive site with photos of and information about hundreds of collectible radio models, including Zenith TransOceanics. There are a few old TV photos, too. Wumpus´s Old Radio World Old Radio World is another good site for finding data about antique or discontinued receivers-- in German. R.L. Drake Virtual Museum, tells Drake radios' history, from the 1958 R1-A to the R8B, along with useful information on Drake radio modifications and fixes. The Sony 7600 Series Page provides detailed information about this series of fine radios, from the original ICF-7600(W) of 1978 up to the current ICF-SW7600GR. Crystal Radios is not about world band, or shortwave, but is an entire society and website dedicated to crystal radios (or "xtal sets"). The site has online plans for cigar box and Quaker oat box crystal sets, information on their email newsletter and books, and more. Digital Radio Mondiale (DRM) is a system for static-free digital world radio broadcasting. On June 16th, 2003, 16 world broadcasters began live, daily DRM broadcasts. Digital Radio Mondiale has had enormous trouble getting off the ground, and as of this writing there are no DRM broadcasts originating in the Americas, and only a few dozen sources in Europe, Asia, Africa, and the Pacific. To hear the broadcasts, you will need to run a DRM software decoder on a PC with a sound card, and input the digital stream to the PC from a DRM capable radio, such as the PC-controlled Ten-Tec RX320D ($329). The DReamM software itself, in version 2.1.1 as of this writing, is free as a C++ source code download, which you would have to compile to a binary executable to run on Windows or Linux. Otherwise, you presumably have to purchase the compiled software, as part of a package along with the receiver and additional control software. 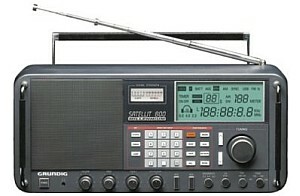 Other DRM-capable PC-controlled radios include the WiNRADiO G313i ($500) PC PCI-slot card and the external USB WiNRADiO G313e ($600), both of which work with WiNRADiO DRM Decoder/Demodulator Plug-in software (DReaM not required). Many Americans believe that if they could only talk to those Russians, everything would be all right. Last week, the U.S. State Department tried it. In a nightly one-hour short-wave broadcast, ambitiously titled the "voice of the United States of America," a staff of 15 Russian-speaking Americans would henceforth give Russia what Secretary of State Marshall called the "pure and unadulterated" truth. In the first broadcast last week (9 p.m. Moscow time), the Voice of America included 20 minutes of straight news. Then followed a twelve-minute lecture on the U.S. form of government, which said, among other things, that the U.S. had lost its fear of the "so-called despotism of the central government." Next came an interlude of cowboy tunes, including The Old Chisholm Trail ("Coma ti yi youpy, yappy yay, yappy yay, Coma ti yi youpy yappy yay," which probably sounded like static to Russian ears), a talk on a new cure for hay fever (the U.S. has 5,000,000 sufferers), and a new method of exploring the Milky Way. When the closing theme, the Battle Hymn of the Republic, went out over the air, Soviet Russia was still at least as distant as the Milky Way. Just as the Voice of America signed off, the Voice of Russia (Moscow Radio's foreign service) went on the air with a denunciation of "U.S. imperialists" who were seeking to "dominate the entire world." And how did the Russians like America's Voice? Reported New York's World-Telegram in a memorable headline: RUSSIANS RESTRAIN JOY OVER U.S. BROADCAST. Listeners who were interviewed said that they liked the music, found that the text did "not sound American." But the Voice of America (which has a long way to travel via an insufficient relay station in Munich) was completely inaudible on all but the very best Russian radio sets, which are owned by the very best Communists. Passport to World Band Radio, once the undisputed annual bible for shortwave listeners, featuring equipment reviews and shortwave schedules, is now defunct. However, you can find used copies of old editions (the last year: 2009) at Amazon. 2003 Passport: The Grundig Satellit 800 [engineered by R. L. Drake] is "...a benchmark receiver, being the first ever to offer such a level of near-tabletop performance at portable prices. Its audio quality and ergonomics are among the best of any world band receiver on the market, regardless of price..."
The Grundig ETON Satellite 750 is $263.53 at Amazon.com. Tabletop: In March, 2005, Drake discontinued their Drake R8B ($1379), the finest tabletop world band listening receiver available. The link is to an eBay search for "Drake R8*". — The Radio Netherlands Receiver Shopping List, a useful guide to current and discontinued world band radios you might be considering purchasing, has been moved to a site called Medium Wave Circle. — More info: Shortwave Reviews and Shortwave Receiver Survey. Sony's excellence in world band technology resulted from personal attention lavished on it by the company's founder, Akio Morita, and several top-flight engineers at the Shibaura Technology Center... after 18 years Sony's flagship world band receiver is about to get the axe... get it while you can... a tireless companion-- two of our monitor's units are still soldiering away after 15 punishing years." eBay, the number one auction site on the Internet, is a great place to find a Sony ICF-2010, Drake R8, Grundig Satellit 800, Zenith Transoceanic, or other fine radio.